Enliven cacao is a varietal blend originating from the North Central Mountains of Nicaragua. They are processed with organic methods and single source beans harvested by cacao farmers in and surrounding La Colonia, whom have been growing cacao for generations. No Fertilizers. Just rich rainforest soil with the perfect pH range. No Herbicides. When you're where you're supposed to be, you don't need any. No Fungicides. Proper pruning allows the right amount of sunlight to reach the pods and prevent fungus or mold. No Pesticides. A natural mixture of native plants and fruits keep the pests in check. Natural Transport Containers. From farm, to fermentation, to drying, to warehouse, enliven cacao is never transported in plastic, synthetic, or metal containers. Only organic, unbleached jute sacks. Natural Fermentation Containers. 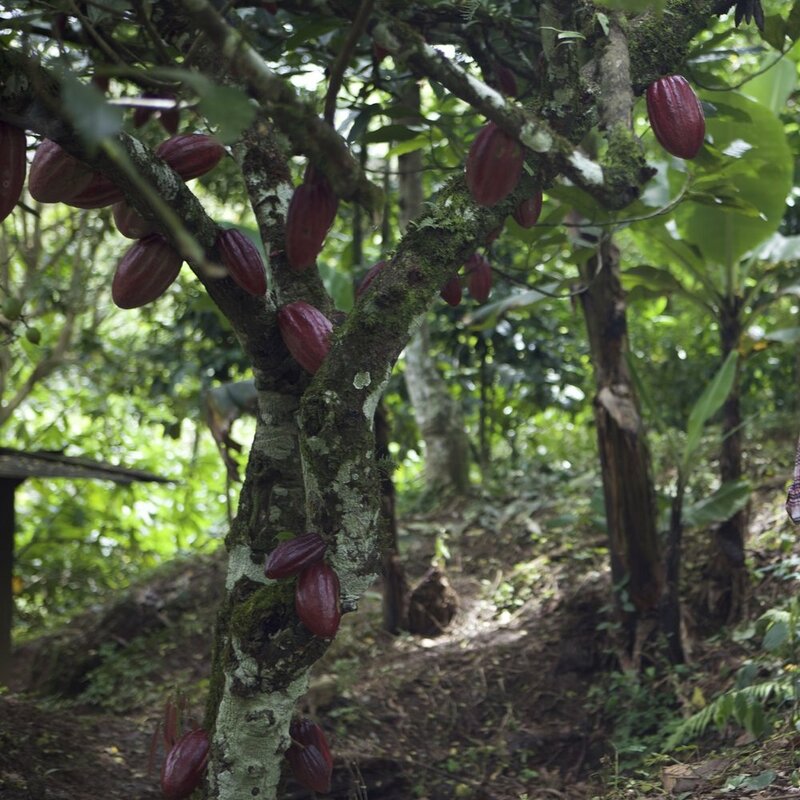 All cacao is fermented in natural, untreated wood boxes with banana leaf insulation, never touching plastics or metals. Natural Drying Area. Fermented cacao beans are laid out onto concrete and ceramic drying platforms, never touching plastics or metals. Natural Heat and Airflow. No fires, artificially generated heat, or fans are used. Only the naturally sunny and arid lowlands surrounding the community. Natural Storage. Dried cacao is placed in organic jute bags and stored in humidity-controlled warehouses on untreated wooden pallets. If you want perfect cacao beans, it helps to start with the perfect environment. The unique combination of the community's elevation, humidity, and ambient temperature provide an unparalleled environment for cacao fermentation. So much so, that techniques such as pod aging and brix testing are unnecessary, and could even be detrimental to both the yield and flavor profile. Wet beans are inspected for acidity, then placed in 1 x 1 x 2 meter untreated wooden boxes. Banana leaves and organic jute sacks are used for insulation. Rotations are completed every 48 hours or as needed to maintain a temperature of 47-52 Celsius. This process, combined with the unique climate, allows enliven cacao to be fermented for at least 7 days. The ability to easily change climates by simply moving down the mountains allows the farmers to go from cacao's perfect fermenting environment to its perfect natural drying environment - low humidity, higher temperature, and far away from contaminants like fires, smoke, fumes, tarmac and livestock. Fermented cacao beans are spread out onto concrete and ceramic drying platforms, never touching plastic or metals, and exposed only to natural sunlight and wind. Enliven cacao is dried for about 7-8 days until reaching a 7.5% moisture content. Each batch is then sampled for flavor consistency. Finally, the dried and hand-sorted beans are placed in organic sacks and stored in humidity-controlled warehouses on untreated wooden pallets. Wet beans are inspected and tested for acidity to detect freshness before being accepted into the fermentation boxes. Fermenting beans are inspected during each rotation phase. Fermented beans are inspected before being transported to drying platforms. Dried beans are inspected before being bagged for storage. Cut tests are performed on each batch. Chocolate is made from each batch and is sampled for flavor consistency. Final inspection and hand sorting is performed after the cacao has arrived in our warehouse in Minneapolis, MN.